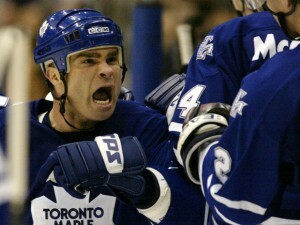 Tie Domi played Junior C hockey with Belle River at the age of 15 and joined the Junior B Windsor Bulldogs in 1985-86. In 1986-87, Domi joined the OHL’s Peterborough Petes and played 18 games as a rookie and two Junior B games for the Peterborough B’s. 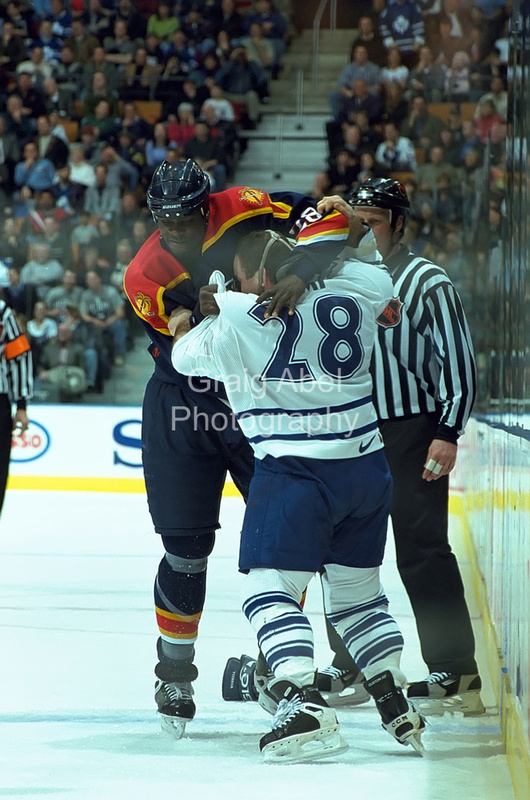 The following season, he joined the OHL Petes full time and tallied 43 points and collected a league-high 292 penalty minutes. In 1988-89, he scored 30 points in 43 games and in the playoffs, he and Mike Ricci helped the Petes capture the J. Ross Robertson Cup. They advanced to the Memorial Cup, but lost out to the eventual champions from Swift Current. 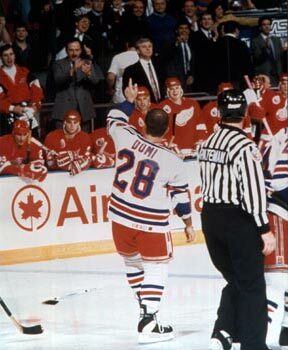 Domi was selected 27th overall in the 1988 NHL Entry Draft by the Toronto Maple Leafs. 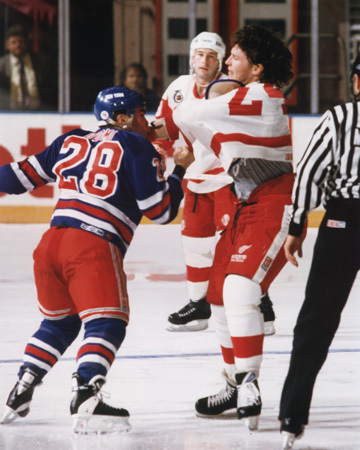 In 1989-90, he made his NHL debut against the Red Wings after starting the season with the AHL’s Newmarket Saints. 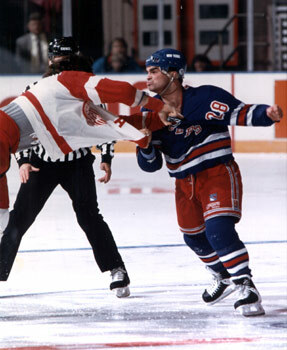 After playing one more game that season he was traded with goalie Mark LaForest to the New York Rangers for Greg Johnston. 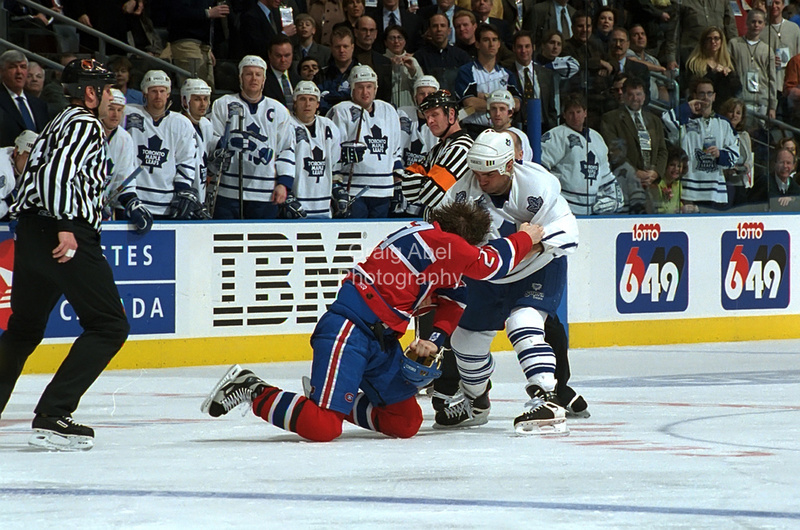 In the 1990-91 season, Domi played 28 games and scored his first goal on March 23 against the Flyers. 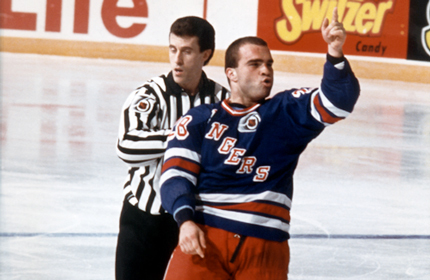 In 1991-92, he joined the Rangers full time and played 42 games as the team won the President’s Trophy championship. In the playoffs, he scored one goal in six games. 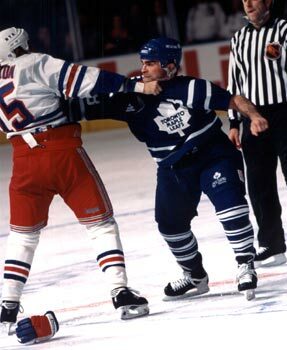 Once again he was best remembered for his fists, rather than his playing ability. 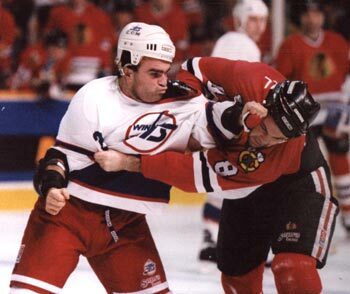 In 1992-93, Domi was traded with Kris King to the Winnipeg Jets for Ed Olczyk. 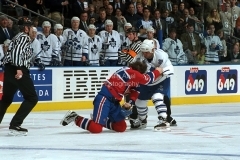 In 61 games between the two teams, he scored 15 points and tallied 344 penalty minutes. 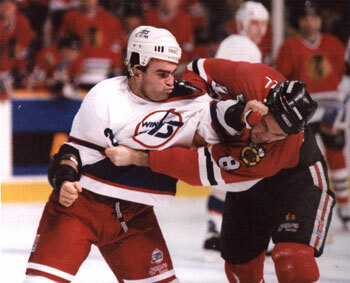 In 1993-94, he played 81 games, scored 19 points and racked up a league-high 347 penalty minutes. 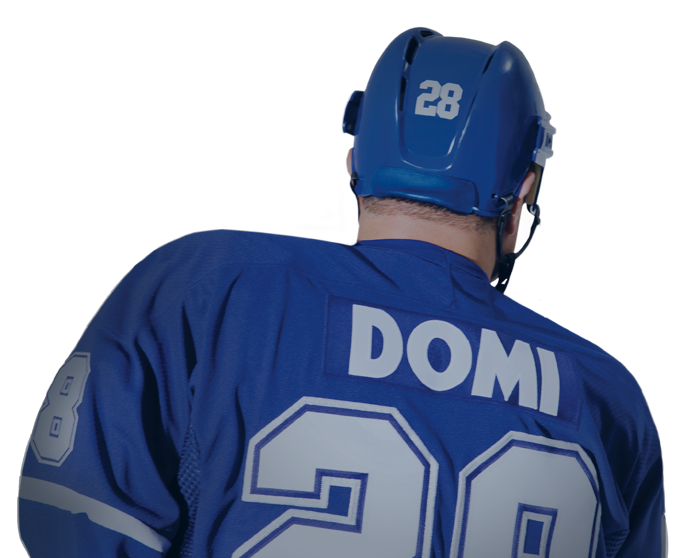 In the shortened 1994-95 season, Domi was traded back to the team that originally drafted him back in 1988, the Toronto Maple Leafs. In 39 games between the two teams, Domi registered nine points. In 1995-96, he tallied 13 points and 297 penalty minutes; in 1996-97, he scored a career-high 17 assists and 28 points while spending another 275 penalty minutes in the penalty box. 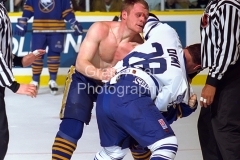 In 1997-98, Domi scored 14 points and recorded 365 penalty minutes. 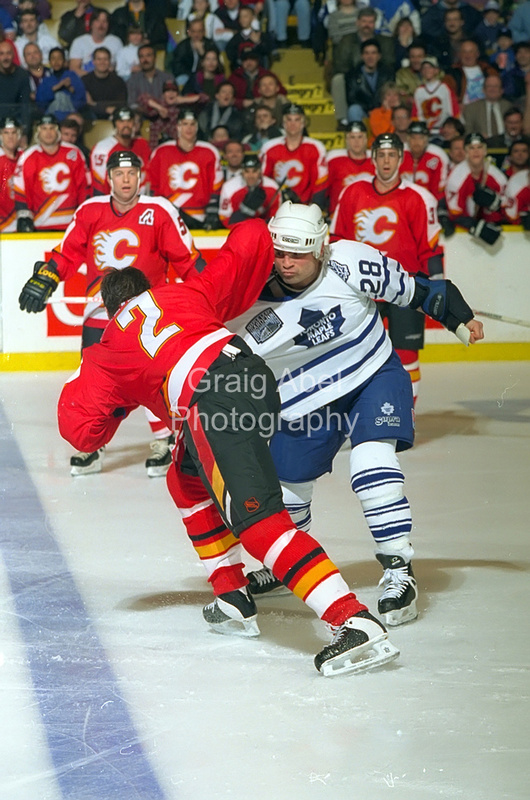 In 1998-99, the Maple Leafs improved 28 points to make the playoffs for the first time in three years. In the playoffs, he helped the team reach the Eastern Conference finals. In 1999-00, he scored 14 points. 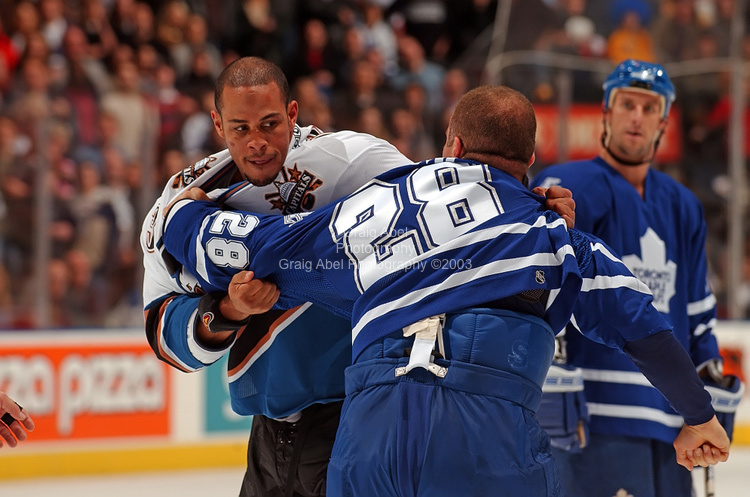 Entering his tenth season with the Leafs’ in 2003-04, Domi has become a more complete player by shaving off his penalty minute totals and by contributing more offensively. 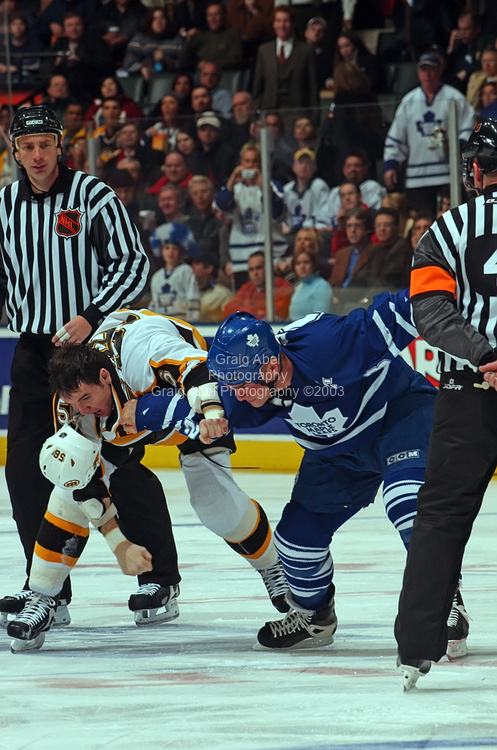 Following the NHL lockout of 2004-05 Domi suited up for the Leafs in his final NHL season. 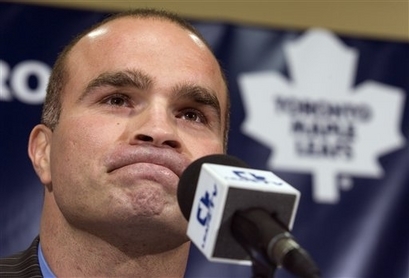 On September 19th, 2006 Domi announced his retirement after 1020 career NHL games. 1. 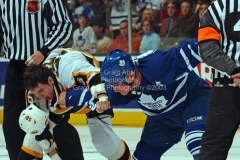 Dennis Bonvie, 1993-2008, NHL-AHL, 4,804; 2. 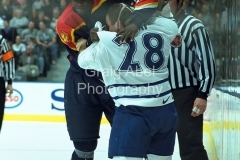 Kevin Evans, 1985-2000, IHL-CHL-ECHL-WPHL-NHL, 4,419; x-3. 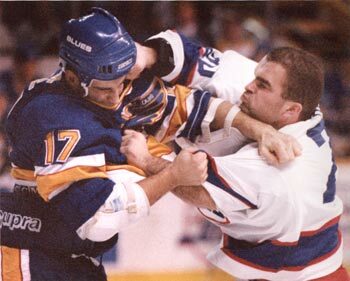 Jason Clarke, 1993-2008, CoHL-ECHL-WPHL-CHL-LNAH, 4,174; 4. Dave (Tiger) Williams, 1974-1988, NHL-AHL-CHL, 4,172; 5. 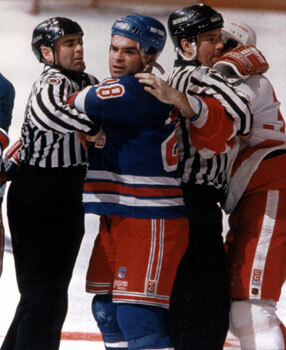 Tie Domi, 1989-2006, NHL-AHL, 4,019; 6. 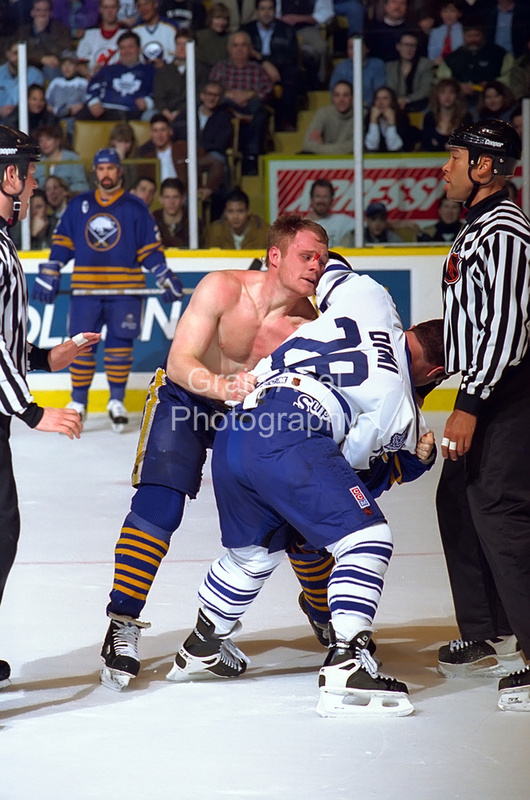 Rob Ray, 1988-2004, NHL-AHL, 4,014; 7. Trevor Senn, 1991-2005, ECHL-IHL-AHL-UHL, 3,993; x-8. Roger Maxwell, 1996-2008, ECHL-IHL-AHL-WPHL-CHL-WCHL-LNAH, 3,960; 9. Tim Hunter, 1980-1997, CHL-AHL-NHL, 3,887; 10. John Brophy, 1950-1973, EHL/IHL, 3,839. Check out what fans had to say about Tie’s retirement. 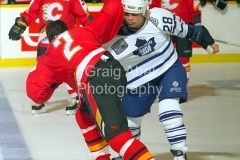 Check out the complete Tie Domi Fight Card @ HockeyFights.com. Have you made Tie the focus point of an art project? From Youtube videos to wallpapers, to Twitter or social media icons, show off your Tie fandom here @ tiedomi.com! 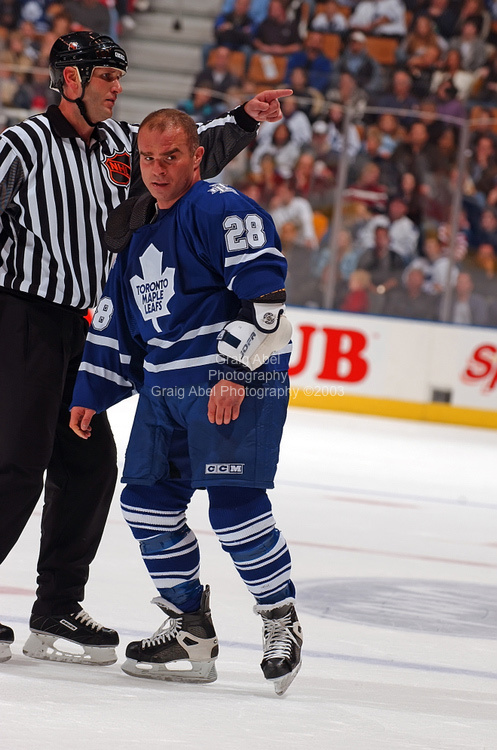 If you have any Tie Domi related artwork feel free to let us know in the comments below.